All the children at Primrose Nursery love playtime when they can have fun in the Nursery sandpit. 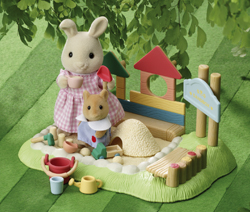 Iain Meadows is often found creating sandcastle masterpieces with the variety of play accessories. Comes complete with Cecile Butterglove and Iain Meadows.